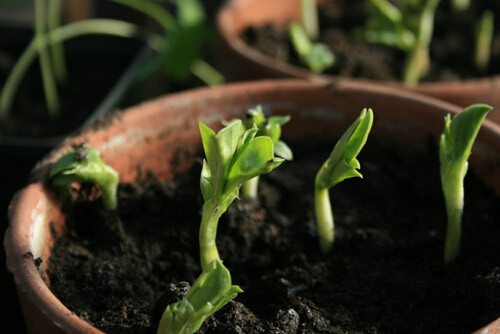 Sow your Broad Beans under glass now for an early crop. Happy New Year! – A few jobs to be done in the garden though. I hope you received lots of lovely Christmas cheer over the festive period and thank you for your kind messages over the last few weeks. It might seem a quiet time in the garden, but there is much that can be done outside in the month of January. It’s a good time to get your mower serviced, perhaps it needs sharpening, or just a general clean up. It’s also a good time to look at the trade catalogs and start planning for your Spring sowing. There are bargains to be had at your local gardening center, as they tend to be quiet so soon after Christmas. Perhaps your greenhouse could do with a clean if you’re lucky enough to have one that is. Maybe that fence needs repairing, or perhaps the shed could do with an additional coat of preservative. If the vegetable patch is not to wet or frozen you could start your winter digging, just remember to work in as much compost as you can get your hands on. Clear your lawn of any leaves that may be left over from the autumn or you could end up with yellow patches where the grass has died off through lack of light. Happy gardening to one and all in 2011.